Remember that old song? Tea for two and two for tea? Or maybe I’m dating myself … That song was my introduction to tea when I was a little girl. My cousin bought me my first tea set when I was five or six. Thrilled, I thought it was the finest bone china. The tiny cups and saucers are just a distant memory now. I don’t remember when I started drinking tea, but I can recall the day I wanted to collect teapots. My mom had a teacup collection as a young girl and gave it to me. I displayed them in a case and thought a dainty floral teapot in the center would look good. I scoured antique stores and fine china departments looking for the right one. I found a beautiful white pot covered in tiny pink flowers. The lid had a rose bud for a handle. I was hooked. I needed more. Collections were very popular back then. Kids had their Beanie Babies, and I had my teapots. At first teapots were hard to find. Most of my early ones came from antique stores. Then suddenly they were everywhere. I had my pick of themes and colors. Finally I ran out of spots to put them. I knew I needed to stop. As we all do from time to time, we change the décor in our home. Colors we loved were now out dated. Wallpaper became a no-no. A major overhaul took place, and suddenly, my teapots didn’t fit in with the new look. Some were tucked away, others sold. I swore off collecting, so no new ones were bought. Guess what I did today? 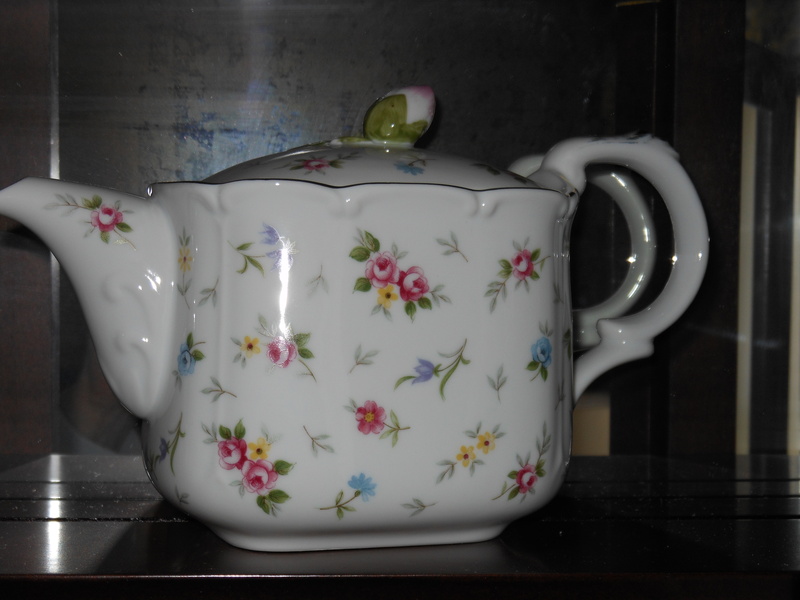 I scoured the web for a teapot. It has to be a certain color and design. To my surprise, teapots have jumped the shark. I shook my head at all the cat, owl and frog designs. A spaceship? Oh. No. There are whimsical, funky, and creative teapots. The world is saturated with ceramic, bone china, cast iron and glass ones. My search finally stopped when I came to Tea Rex. I won’t give up the search, but don’t plan to collect again. I need just one teapot, and when I find it, I’ll know it. The place of honor sits empty, waiting for the elusive pot. Does it have to be a teapot, I was asked? Yes, it does, for lots of reasons. To bring back memories. To remember my collection. And because I like tea.